Description:- Phosome 50 mg injection is used in the treatment of serious fungal infections and kala-azar. It kills fungus by preventing them from making their protective covering. 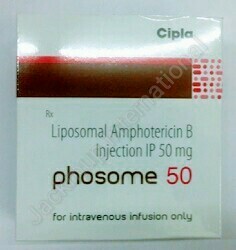 It can be taken with or without food, but it is better to take Phosome 50 mg injection at a fixed time.